Current theories explaining the observed planetary ring structures for the most part describe gravitational interactions between ring material, nearby satellites and the parent planet. As the mass of each of the four solar gas planets exceeds the mass of their respective satellites by several orders of magnitude, the planetary influence on the behavior of ring particles is likely to be far greater than that of the satellites. When applied to an isolated planet-ring system (without the influence of nearby satellites), Newton�s theory of gravitation allows a rotating object to occupy one of an infinite number of possible Keplarian orbits, however does not maintain any intrinsic preference for one orbit over another. Hence, an elaborate ring structure, as observed in the Saturnian system, is unlikely to be explained simply by Newton�s predicted gravitational interaction between ring particles and their parent planet. Such structure, even if formed, would be expected to decay over time. Current theories thus mainly center on orbital resonances between ring particles and satellites as the possible underlying cause for the planetary ring structure. Finally, current theories that explain the structure of ring systems via interactions between their ring particles and satellites do not address questions as to why gas planets have a large number of satellites, or why those satellites rotate at their specific orbital locations. Careful analysis of the orbital periods of satellites reveals that the resonances that occur between rings are of the same kinds that occur between satellites and rings, or between different satellites. This strongly suggests that satellites and rings were formed from the same material via the same mechanism. It is proposed by the UG theory that planetary satellites follow the same orbits previously occupied by former rings. This view is further strengthened by the observation that both Saturn and Uranus have rings and satellites that share the same orbits. Therefore, we are left with the classic chicken and egg question: which came first, the rings which formed the satellites or the satellites which formed the rings? Although Newton�s theory of gravitation (as well as general relativity) has been repeatedly tested and proven to work well in our Solar System, a four hundred year old question, which is older than the Newtonian theory itself, regarding the origin and the mechanisms underlying Saturn�s ring structure remains unsolved. This query will be evaluated via a UG analysis of the Saturnian ring system. The present goal, however, is to demonstrate the power of the UG theory and its ability to provide the general morphology and characteristics of complex systems on all distance scales. Therefore, the current UG analysis of planetary rings will be limited to Saturn�s main body of rings, specifically rings D, C, B, A and the Cassini Division. Nevertheless, the same methods and techniques used here may be applied to the remaining planetary ring systems. Rule 1: In a steady state condition, all orbiting SHP groups with a zonal oscillation range exceeding their orbital radius around the center of an astronomical body share the same angular velocity , where is the angular velocity of the central core of the astronomical body. Rule 2: As a consequence of equation 5-1, and the requirement that the velocity of a superheavy particle cannot surpass the speed of light, all superheavy particles with a zonal oscillation range greater than must reside within the distance from the center. The strength of a theory is determined by its ability to explain all observed phenomena using a minimal number of variables and assumptions, as well as its ability to correctly predict the outcome of new experiments. The goal of the current exercise is to demonstrate the ability of the UG theory to explain the observed structure of Saturn�s main body of rings, specifically rings D, C, B, A, F and the Cassini Division, using a simple model of very few variables. As discussed, a UG-based model that is capable of explaining a vast and complicated structure such as Saturn�s ring system requires superheavy particles orbiting at relativistic velocities. The simplest possible UG model that fulfills this requirement consists of a single SHP group with superheavy particles of particle mass rotating at a speed of in a circular orbit of radius around the planetary center (using a total of five independent parameters , , , , and , where denotes the overall mass of Saturn�s ordinary matter). This simple model will be demonstrated to successfully explain the general structure of the Saturnian ring system, as well as a number of principal ring characteristics. In particular, the model will address the origin and stability of the current ring structure, spiral wave patterns within the rings,12 the observed dynamic changes in structure occurring over time, and the phenomenon of spokes. While successful in explaining the general ring structure down to a scale of a few hundred kilometers, the simplified model does not produce the observed fine structure of Saturn�s rings. Resolving this issue thus requires the addition of at least one more SHP group. To keep the complexity of the model to a minimum, a second group of SHPs of the same mass rotating at a velocity of around the center of the planet in a circular orbit of radius can be added, increasing the total number of independent variables to seven. In this example the variables , , , , , and were selected. For simplicity, was replaced by , where , and was replaced by , where .13 The above analysis will be shown to produce a fairly accurate model of the general structure as well as the underlying fine-scale structure of Saturn�s main body of rings. where the contribution of Saturn�s ordinary matter is absent.15 Equation 5-3d was employed to construct two dimensional color-coded maps of the resultant calculated energies as functions of the SHP mass , the velocity of the SHP group and its radius of orbit .16 The constructed maps were then compared with published images of Saturn�s main body of rings, which comprise of rings D, C, B, A and the Cassini Division. 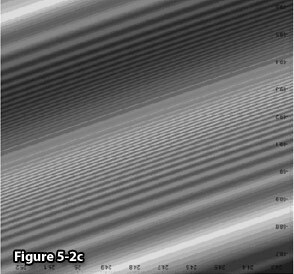 Figure 5-1 provides a UG calculated map in comparison to an observed image of Saturn�s ring system generated using RSS 3-wavelength occultation data recorded by NASA�s Cassini satellite, which samples a single trace radially through the rings. A reasonably good fit was found using a single group of SHP mass rotating at a speed of in a circular orbit of radius around the center of Saturn. The calculated map of Saturn�s ring plane, drawn between the planet and the edge of the A ring at , reveals large spiral structures encircling the planet. A low level of potential energy, and therefore a high density of matter, can be observed in the lighter areas of the UG map (demonstrated in the vicinity of and ), and a high level of potential energy, and therefore a low density of matter, or even gaps are observed in darker regions (viewed in the vicinity of , and from the planetary center). At a display resolution of lower than approximately , the calculated map bears a significant resemblance to the observed large-scale structure of Saturn�s ring system. However, figure 5-1a, as well as other observed images recorded by Cassini and Voyager, reveals additional fine structure that is not present in the simple calculated model of a single SHP group. As discussed, in order to provide for the general large-scale as well as the fine-scale structure of Saturn�s rings (while keeping the complexity of the model to a minimum), a second orbiting SHP group of the same SHP type was added. Following equation 5-1, the velocity and the orbital radius of the second group are related via . The velocity and the radius of orbit were calculated using the fine structure observed in the D ring. Closest to Saturn, the D ring consists of a number of faint, narrow ringlets. The inner edge of the D ring is indistinct, and the forces that sustain this part of the ring are poorly understood. 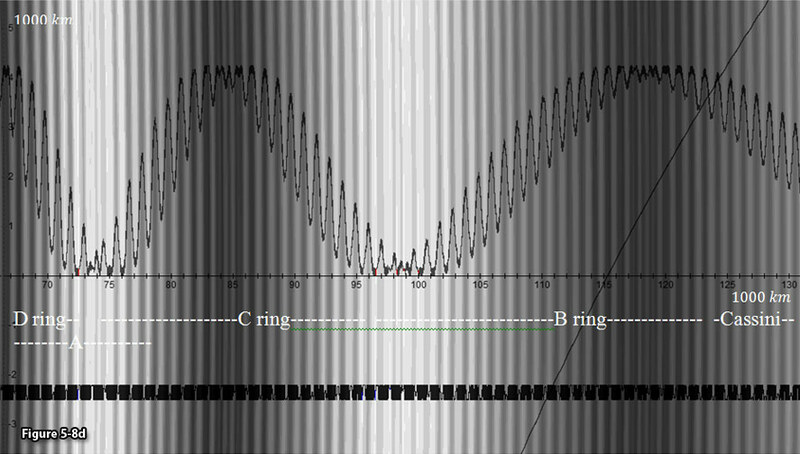 Furthermore, as shown in figure 5-2a, a new type of regular pattern, yet unexplained, was detected in the gap between the D73 ringlet and the C ring. This pattern was found to consist of a fine structure of a wavelength of approximately (Hedman, Burns & Showalter, 2007). 5-1b: UG calculated image of Saturn�s main rings. Figures 5-1a and 5-1b:Displays a comparison between the UG calculated zones providing rings D,C,B, A and the Cassini Division (figure 5-1b) and Saturn�s observed ring profile (figure 5-1a). In figure 5-1a areas depicted in green and blue are dominated by small particles, and areas indicated in violet consist mainly of large particles. White areas indicate regions that were so opaque that the size of particle could not be determined. Image credit for figure 5-1a: NASA/JPL; http://photojournal.jpl.nasa.gov/catalogue/PIA07872. Figure 5-2a: Image obtained from NASA/JPL/Space Science Institute. http://photojournal.jpl.nasa.gov/catalog/?IDNumber=PIA08990. Figure 5-3 displays the calculated narrow radial section of the D ring in the range of , providing a number of faint, narrow ringlets, in agreement with observations. The C ring displays several empty gaps containing sharp, eccentric ringlets. While according to current theory, a few of the gaps may be identified with satellite resonances, a number of observed gaps remain unexplained. The ring pattern consists of spiral waves, as well as bright regions of high particle density informally referred to as �plateaus.� The density of particles is relatively uniform within the boundaries of the plateaus, and their sharp structure is maintained despite the expected spreading or diffusion of material. A view of the outer C ring and the surrounding Maxwell gap is displayed in figure 5-4, providing the comparison between a calculated section (figure 5-4a) and an observed view of the ring obtained by Cassini (figure 5-4b). Both images reveal a series of regularly spaced plateau structures of about wide, nearly symmetrically placed around the Maxwell Gap. Note that there is no known satellite or resonant structure to explain this symmetrical placement. The B ring is dense, bright, massive and radially extensive, demonstrating successive regions of abundant fine-scale structure as well as irregular regions with little or no fine structure occuring on a scale of or more. There are no clear gaps in the ring, however the Huygens gap, which contains an eccentric ringlet, resides at its outer edge. Whereas the confining mechanism of the B ring�s inner boundary is unknown, its outer boundary is currently thought to be caused by a 2:1 resonance with the satellite Mimas. Figure 5-3: Display of the calculated structure of narrow ringlets within the D ring using the parameters , , , , and . Figure 5-4b: Image credit: NASA/JPL/Space Science Institute; http://photojournal.jpl.nasa.gov/catalog/PIA06540. Figure 5-5 displays a calculated section of the B ring (figure 5-5a)22 compared with an image shuttered by NASA�s Cassini satellite of the lit face of its middle region (figure 5-5b). Both figures demonstrate abundant structure with a scale of a few hundred kilometers and very little ultrafine-scale structure. Very-fine-scale structure is observed in the outer B ring, shown in figure 5-6c. Figure 5-5a: UG calculated B ring section. Figure 5-5b: Image credit: NASA/JPL/Space Science Institute;	http://photojournal.jpl.nasa.gov/catalog/PIA06535. Figure 5-6a provides the calculated two dimensional map of the outer B ring, the Cassini Division and the lower A ring. Areas of abundant ultra-fine structure can be noted within this region. Figures 5-6b and c provide a comparison between the calculated region of the Cassini division external to the bright outer B ring (figure 5-6b)23 and an observed image obtained by Cassini (figure 5-6c). 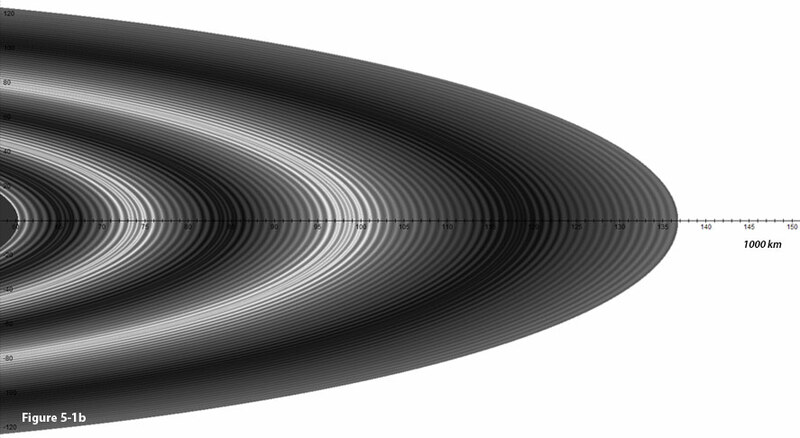 The calculated zonal structure provides the general regular pattern observed in the rings of the Cassini division. Figure 5-6a: A UG calculated two dimensional map of the outer B ring, the Cassini Division and the lower A ring. Figure 5-6b: UG Calculated B ring section. Figure 5-6c: Outer B ring, image credit: NASA/JPL/Space Science Institute; http://photojournal.jpl.nasa.gov/catalogue/PIAA06535. Figure 5-7a displays a detail of Saturn�s A ring interior to the Encke gap taken by the Cassini ISS instrument. On the right the image reveals spiral bending waves, where the wavelength decreases inwards, and on the left a succession of spiral density waves, where the wavelength decreases outwards. As the image is viewed from the unlit side of the rings, opaque regions appear darker. In the calculated UG model similar patterns of spiral density and bending waves were found in several rings. A section of spiral waves in the A ring is demonstrated in figures 5-7b, 5-7c and 5-7d. Note that in figure 5-7b, drawn with , the calculation provides fewer waves than observed. Elevating the velocity of the second SHP group to increases the number of waves, and in the case of the D ring, results in better agreement with observation, as displayed in low resolution in figure 5-7c and in higher resolution in figure 5-7d. In addition, both the calculated and observed images of figure 5-7 reveal regions of abundant fine-scale structure adjacent to smooth regions of little or no fine-scale structure. Note that figure 5-7c, where the velocity of the second of SHP group ,bears a particularly close resemblance to the observed A ring. The spiral that produces the F ring is likely to be a continuation of the spiral which forms the D,C, B, and A rings and the Cassini division. Following the discussion in footnote 91 of this chapter, the Roche midsection, where rings and satellites coexist, starts at about the radius of the satellite Pan. The gaps observed between the A ring and the F ring and beyond the F ring may be located at the UG sub-zones where the cosine terms either enhance coalescence, or are too small to prevent the ring particles from coalescing into satellites. These gaps may also be cleared by the gravitational effect of nearby satellites, such as Atlas, Prometheus, Pandora or Mimas, via resonances or the mechanism summarized in section V-1. Therefore, the F ring is likely to be a narrow ring that is contained within a zone in which matter cannot coalesce, surrounded from both sides by areas where matter is swept away. Recall that the value of between and was derived from the observed wavelength of the ringlets in the D ring, and seems to be confirmed by the agreement between the calculated and the observed ring sections provided in figures 5-1 to 5-7. This range of velocity provides for fine structure in the range of to in wavelength. However, Saturn�s rings appear to contain some ultra-fine structure in the range of few kilometers or less. Consequently, for stronger agreement between theory and observation, three or more SHP groups may be required. There is still the question of what provides for the stability of these wide rings. In the Newtonian scenario, during each orbital rotation a ring object must lose a minute amount of energy in the form of gravitational radiation. As the object�s energy is reduced continuously, its orbit is expected to draw closer and closer to the planet, until eventually becoming consumed by it. This process may last for at most few tens of millions of years before the ring system dissipates completely. Within this timeline, Saturn�s rings would be expected to have existed for 100 million years at most, a period which is too short to allow for the presence of the elaborate fine structure observed. For Saturn�s ring system to remain stable over the length of time required for the formation of its fine structure, there must be a continuous source of new energy or new matter to replenish the ring system. Figure 5-7a: Spiral bending waves (right) and density waves in Saturn�s A ring interior to the Encke Gap. Image credit: NASA/JPL/Space Science Institute; http://photojournal.jpl.nasa.gov/catalogue/PIA06093. Figure 5-7b: Calculated using . Figure 5-7c: Calculated using . 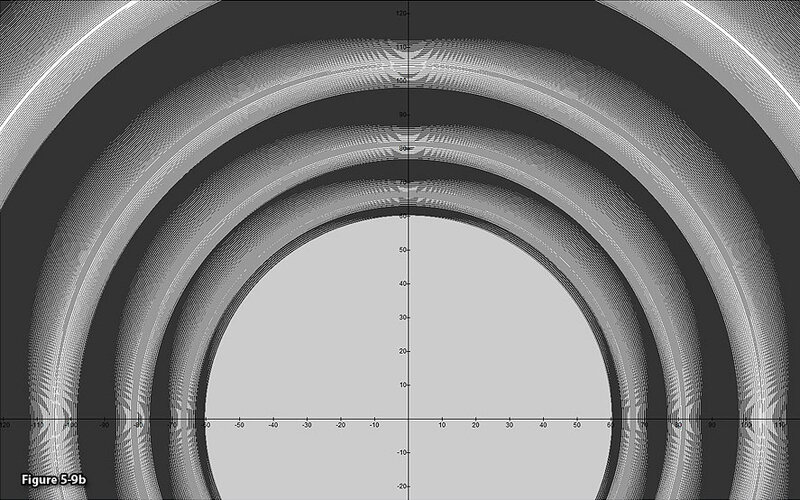 Figure 5-7d:Calculated at higher resolution using . As the observed orbital period of the ring matter is Keplerian, the overall force exerted on the ring particles is very close to Newton�s gravitational force (see section V-6), and consequently, the particles cannot be accelerated to the high velocities needed to keep up with the high propagation speed of the minima of the rotating pattern of the potential energy. Therefore, the rapid, outward moving maxima and minima contours will encounter the orbiting object on a periodic basis, where the time between two successive respective encounters is less than or approximately equal to seconds, the approximate time it takes the SHP groups to complete one full rotation.26 As the object must encounter an oscillation maximum every seconds or less, the minute amount of energy lost during one orbital period will be replenished by the next encounter with the following maximum. These periodic encounters create a barrier that prevents the object from gradually losing energy and falling towards the planet. Hence, the orbiting object behaves as a driven harmonic oscillator, where the force applied on the object by the rotating spiral pattern of the SHP groups provides a periodic driving force. As the overall motion of the object is in accordance with Kepler�s laws, this driving force is substantially smaller, yet not negligible relative to the force applied by Saturn�s ordinary matter. Thus, the force exerted by the orbiting SHP groups provides a small perturbation to the overall force exerted by the planetary ordinary matter, causing the rotating object to oscillate slightly around its Keplerian orbit. In figure 5-8 three waveforms are overlayed with two dimensional calculated images of the potential energy of the given object.28 The oscillating waveform displayed entirely above the axis provides the total contribution of both SHP groups, without the contribution of Saturn�s ordinary matter. The second waveform, characterized by distinct trains of rapid oscillations, is displayed entirely below the axis and provides the exclusive contribution of the second SHP group (with . The third smooth waveform crossing the axis provides the overall contribution of Saturn�s ordinary matter and the significantly smaller contribution of both SHP groups (given by the first waveforms).29 As demonstrated in the figure, the potential energy of the SHP contribution is highest within the area covered by the Cassini Division (between approximately and ) where the oscillations of the upper waveform appear to almost flatten, with significant reduction in amplitude and wavelength. This process further accounts for low particle density in the Cassini Division. The Cassini Division is located in the vicinity of a zonal maximum of the first SHP group with a velocity of (see figures 5-8a and b), where the amplitude of the local oscillations nearly diminishes. In areas where the oscillation amplitude diminishes completely, the periodic driving force will reduce to zero, and the ring material will dissipate over time to produce a gap. In the remaining areas of the Cassini Division, where the oscillation amplitude is significantly reduced but not entirely eliminated, a very faint ring structure may be observed. Based on the above discussion, strong rings should be observed in regions where the amplitude of the outward moving oscillations is substantial. Looking at the same image, the relatively large amplitude of the oscillations produced by the upper waveform between and the Cassini division (starting at about ) explains the absence of gaps, as well as the relatively large optical depth of the B ring. An abundance of fine structure in the outer B ring can also be noted. As demonstrated in the figure, the oscillation amplitude of the contribution of the first SHP group in the middle B ring is significantly larger than the oscillation amplitude contributed by the second SHP group, however both contributions become comparable in size at the distance range of the upper B ring and the Cassini Division. Therefore, the fine structure oscillations contributed by the second group in the middle section of the B ring are insignificant (see Figure 5-8a), while in the general area of the Cassini Division the fine structure becomes relatively substantial. An enlarged view of the Cassini Division surrounded by the outer B ring and the inner A ring is provided in figure 5-8b. As expected, the ring structure in this area displays an abundance of fine structure. Figure 5-8a: UG calculated ring section. Viewing the fine structure presented by the upper curve in figure 5-8b, the wavelengths of any two adjacent sections of rapidly oscillating waves are shown to increase in opposite directions. This may explain the observed occurrence of spiral density waves, where the wavelength decreases outward, as well as spiral bending waves, where the wavelength decreases inwards (See figure 5-7). Note that according to current theory, spiral density or bending waves are thought to be created by gravitational interactions with Saturn�s moons. However, in many instances, no sufficiently large moons were found in proper locations for creating them. Figure 5-8b: UG calculated ring section. Figure 5-8c displays an enlarged view of the middle B ring. The calculated waveforms overlayed on the two dimensional image demonstrate long stretches of over one hundred kilometers of little or no fine structure. In figure 5-8d, the calculated display is extended to cover Saturn�s D, C, B and A rings and the Cassini division. Note the similarities between the oscillation patterns extending from about to , and between those extending from about to . This may account for the structural similarities observed between the C ring and the Cassini Division. Figure 5-8c: UG calculated ring section. Figure 5-8d: UG calculated ring section. One of the more peculiar phenomena observed in Saturn�s rings are the spokes, first observed by Voyager in 1980. Spokes are nearly radial structures, observed to appear intermittently in the B ring. Viewed from low phase angles (shown in figure 5-9c), they appear as dark markings along a bright underlying B ring. Conversely, spokes may appear brighter than the ring when viewed at high phase angles, or against the ring�s unilluminated side (see figure 5-9d). A surprising property of the spokes is that they maintain their shape in spite of the differential rotation that occurs in the underlying B ring. This indifference to rotation is not consistent with orbital mechanics, and cannot be explained by Newtonian gravitational forces. As they are observed to rotate at approximately the same rate as the rotation of Saturn�s magnetic field, spokes are commonly attributed to interactions of charged particles with Saturn�s magnetic field, however the origin and exact nature of these features are not yet well understood. According to the UG theory, the phenomenon of spokes can be explained as a by-product of a relativistic effect, where a pattern is generated as a consequence of the relativistic distortion of spacetime by the rotating SHP groups, and captured by the camera�s matrix of sensors. This calculated phenomenon is demonstrated in figure 5-9a, where equation 5-3d was used in order to show that even a single SHP group is capable of creating spoke structures. The equation was applied using the parameters of the first SHP group ( , , , and for simplicity, ). 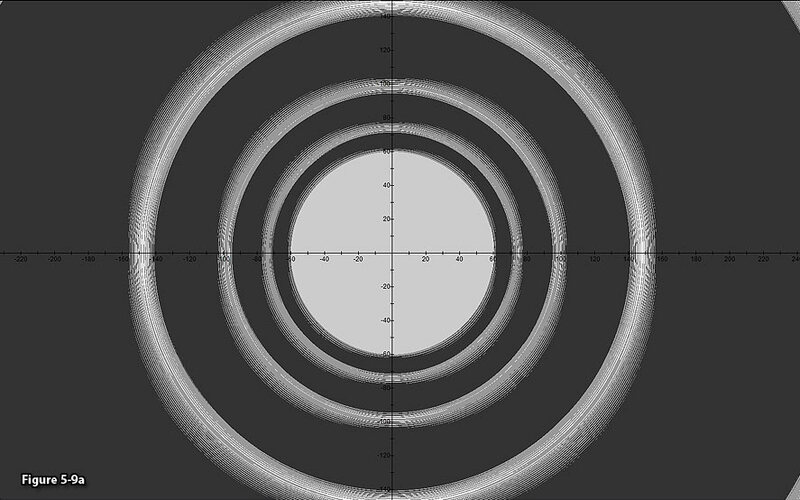 The resultant figure displays a two dimensional image of the rotation plane of Saturn�s rings, drawn using a single threshold level in order to maintain a high level of contrast. Consequently, any position on the ring plane where was layered in gray, while any position where was indicated in white. The resultant set of rings display features that fit the general description of spokes as observed in figures 5-9c and 5-9d.30 Moreover, the locations of the calculated spokes remain stationary over time relative to the frame of reference of the planetary center, which implies that they rotate with Saturn while maintaining their shape, as observed. It is further implied that these features are fixed within the coordinate axes. As the rotation rate of Saturn�s magnetic field is very close to the overall rotation rate of the planet around its axis, the calculated spokes appear to rotate at approximately the same rate as Saturn�s magnetic field. Figure 5-9a: Displays spoke features in the rings. The calculated figure was generated using parameters of , , and ,where the point is layered only if and . The visibility of spokes and the clarity of their patterns may depend on the angle between the Sun and the rotation plane of the rings, or on the angle between the camera and the rings� rotation plane.31 This may account for the intermittent appearance of spokes in the B ring, which is currently attributed to their being a seasonal effect. In addition, although spokes are uniquely observed in the dense and massive B ring, the calculated figure shows that spoke features can appear in other rings as well, suggesting that the visibility of the radial spokes may further depend on the density of ring matter or on the size of the ring particles. Figure 5-9b: In order to provide a vivid image of spoke features, the parameters were modified to , and , where the point is layered only if and . Figures 5-9c and 5-9d: Voyager images of radial spokes in Saturn�s B ring. Spokes appear dark against the B ring at low phase angles (5-9c) and bright against the B ring at high phase angles (5-9d). 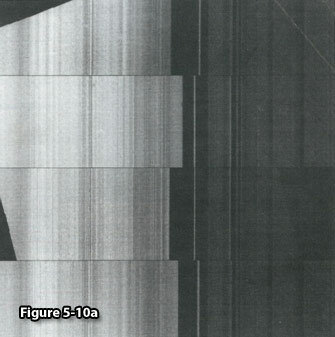 Credit for figure 5-9c: image obtained by Voyager 2; NASA/JPL; http://photojournal.jpl.nasa.gov/catalogue/PIA02275. Credit for image 5-9d: image obtained by Voyager 1; NASA/JPL; http://photojournal.jpl.nasa.gov/catalogue/PIA02269. Due to the effects of special relativity, superheavy particles rotating at relativistic velocities create a distortion of spacetime. As a result of this distortion, and of the finite speed of gravitation, the otherwise circular zonal minima are replaced by a distorted rotating spiral. Hence, the width of the ring will vary with azimuth, and its orbit will depart from a pure circular shape. This effect becomes stronger as the orbital speeds of the SHP groups increase and their radii of orbit are reduced. As demonstrated in figures 5-9a and 5-9b, the calculated zonal structure and its minima expand outwards, where the level of expansion varies with the azimuth of the ring section, resulting in a non-circular outer boundary of the rings, while the inner boundary retains a circular morphology. The non-circular structure of the outer edge of the rings resembles the boxiness observed in galaxies (see Chapter VII), as both phenomena are created by the same relativistic effect. Similar to the dynamics of the calculated radial spokes in Saturn�s B ring, the calculated ring boundaries maintain their shape in spite of the differential rotation that occurs in the underlying B ring. In figures 5-9a and b, all of the calculated rings demonstrate some degree of boxiness. Data obtained by Voyager and Cassini reveals that ring structure varies with time and azimuth. Figure 5-10a provides a composite image of four views of the outer edge of the B ring, assembled from images shuttered by Voyager 2 at two different times and at two different azimuths (Miner, Wessen & Cuzzi, 2007). An offset of about in the radius of the outer edge of the B ring as well as significant mismatch in its fine structure can be noted.32 These findings can be explained by two different phenomena. Boxiness, explained above, may account for a large part of the offset of the outer edge of ring B between the two azimuths. In addition, as the zonal structure is driven by a rapidly rotating spiral that changes over time and azimuth, the ring pattern is also expected to shift over time and to change between different azimuths. Both SHP groups are calculated to complete a full rotation in about seconds, suggesting that some features of the fine structure of the rings must change at a rapid rate. Figure 5-10b displays two calculated radial sections of the same region covering the outer edge of the B ring and the inner Cassini Division at two different times seconds apart. The images are positioned so that their large-scale pattern is aligned. Note that similar to observations, the fine structure in the outer B ring does not match between the calculated images. Mismatch is also observed, but to a lesser degree, in the Cassini Division. Figure 5-10a: The composite image of four views of the outer edge of the B ring assembled from images collected by the Voyager 2 Spacecraft. Displayed on the left is the bright B ring, at the center is the dark Huygens gap (of variable width) containing a narrow elliptical ringlet, and on the right is the Cassini Division (Voyager 2 image 260-1473, obtained from Miner, Wessen & Cuzzi, 2007). Thus far, the following parameters of the two SHP groups were estimated: the SHP mass , the orbital radii and , the velocities and , and the approximate ratio of , where and respectively denote the number of superheavy particles in the first and second SHP groups. In addition, the mass of the Saturn�s ordinary matter is already known. Still missing, however, is an assessment of the approximate values of and .33 Using Kepler�s third law, the calculated orbital periods of each of the known satellites internal to the orbit of Lapetus (at about )34 were compared with their observed values. The calculated orbits were found to fall between and of the measured values (see table 5-1). As the effect exerted by Saturn�s superheavy particles is expected to cause the orbital periods of the satellites to deviate from their Keplerian predicted orbital periods, the measured deviations limit the possible number of SHPs of mass . According to table 5-1, the maximum deviation of an orbital period of a satellite is within (see the satellite Anthe at ). Substituting , , (therefore, ), and using the approximation of , equation 5-10 yields . The earlier estimate of thus provides , which translates to a total of of SHPs of mass . Hence, the overall SHP mass is negligible compared with the overall mass of Saturn�s ordinary matter, and bears no influence on objects dominated by the ordinary matter external to the zonal oscillation range of the SHPs with ordinary matter. Note, however, that the current published mass of Saturn was calculated from the orbital periods of its satellites, under the assumption that their motions are governed purely by Newtonian dynamics. If the SHP contribution is taken into account, the mass of Saturn may be altered by less than 0.3% (according to table 5-1), or by an amount of the order of . Table 5-1: A comparison between the Keplerian calculated and the measured orbital periods of Saturn�s Satellites (the calculation uses Kepler�s third law, while arbitrarily assuming a perfect match for Mimas). A very simple model providing the interaction between two orbiting SHP groups composed of a single superheavy particle type and a spherically symmetric distribution of ordinary matter around the center of Saturn produces a zonal pattern that bears a close resemblance to the observed structure of Saturn�s main body of rings, and can further account for a number of ring characteristics, including the appearance of spokes, gaps, ringlets, the appearance of spiral density and bending waves, and the general fine structure distribution. Note that the goal at this stage is limited to demonstrating the power of the UG theory and its ability to provide the general morphology and characteristics of complex systems on all distance scales via the use of the simplest model possible. No effort was made here to explain the remaining outer rings, such as the G and E rings, or to extend the discussion to model the formation and orbital locations of the Saturnian satellites. Saturn�s main rings were selected for a UG analysis as they are the most complicated and the least understood rings observed to date. The same tools used for the analysis of the Saturnian system can be used for modeling the simpler rings and satellite systems of Jupiter, Uranus and Neptune. The success achieved by this simple model in explaining the complex structure of Saturn�s D, C, B, and A rings and the Cassini Division, coupled with the success of an even simpler model (using a single or binary SHP groups with as little as four parameters) in explaining various morphologies observed in galaxies and nebulae (in Chapter IV) provides a strong testament to the power of the UG theory, and further suggests that the addition of few more SHP groups, and additional fine-tuning of their parameters, may explain these complex systems down to very fine details. The UG approach suggests that the rings are generated by orbiting SHP groups, and provides a mechanism to keep them stable over a long period of time. As superheavy particles are most likely to be created by the collapse of the cloud of gas that formed the planet (see Chapter VII), planetary rings may be as old as their parent planets, and almost as old as the Solar System itself. This resolves the current contradiction, where according to the Newtonian scenario, the observed planetary rings could not have existed for more than a few tens of millions of years, while the Saturnian rings require a significantly longer period of time for developing their complex fine structure. 1A summary of what is known about the planetary ring systems, the current leading theories, and which features within the rings have not yet been adequately explained is provided in Planetary Ring Systems by Miner et. al (Miner, Wessen and Cuzzi, 2007). 2 Another mechanism, known as a Lorentz resonance, is theorized to be capable of creating planetary rings with dust-size particles, by which small particles located slightly inward to or outward from the Lorentz resonance radius experience small forces that push them away from the resonance radius. Over time, the region around the ring may become depleted of dust-size particles. This process, however, cannot explain the existence of rings consisting of larger objects. 3 Saturn�s F ring and the dense, narrow rings of Uranus rings were initially thought to have formed via gravitational shepherding. However, new discoveries have challenged this theory. 4 With the current available observation resolution, any satellites with a diameter larger than one kilometer should have already been detected. 5 An alternative theory suggests that the Uranian rings were formed by the trapping of outward drifting particles between resonances of the planet�s inner satellites(Fridman & Gorkavyi, 1994). After their formation, the rings left the resonances that produced them and drifted hundreds of kilometers toward their current positions. 6It is current belief that eruptions from the moon Enceladus are the main source of material replenishment for Saturn�s E ring. 7NASA (December 12, 2007). �Saturn�s Rings May be Old Timers.� Press release. Retrieved 2007-12-27. Archive copy at the Internet Archive http://www.nasa.gov/mission_pages/cassini/media/cassini20071212.html. 8 The zonal oscillation range of a superheavy particle of mass and an ordinary particle of mass is given by . The planetary center is within the oscillation range of the SHP, which orbits at a radius when . 9 In contrast, a superheavy particle group in orbit around the central core moving at a speed of creates a narrow circular ring of the type demonstrated by Uranus. 10 Planetary ring particles or objects are assumed to be too small to support superheavy particles of their own, thus they contain only ordinary matter. 11 Based on Newtonian gravitation, a planet�s Roche limit resides at about , where is the radius of the planet, and provide the average densities of the planet and the object respectively, and is a constant, where for the case of a rigid satellite and for the case of a fluid satellite. Relying only on Newtonian gravitation, it is difficult to explain the range of radii where both rings and satellites are observed to coexist (for example, in the range starting with the Encke gap, which contains the satellite Pan, up to Pandora�s radius of orbit between the A ring and the F ring). The intermingling of rings and satellites can be explained relatively easily via the UG theory, as the potential energy of the object due to the contribution of SHP groups contains cosine terms that oscillate as a function of the inverse of their distance from the object. In the range of radii in the vicinity of the classical Roche limit, or , the additional oscillating terms create sub-zones in which the tidal forces of Saturn prevent additional coalescence, where planetary rings can consequently be retained. These sub-zones are separated by a second set of sub-zones in which the tidal forces enhance coalescence, or are simply too weak to prevent it, possibly resulting in the formation of a satellite and in the consumption and/or ejection of the enclosed ring material. Therefore, in this range of radii, a series of narrow rings and small satellites can coexist. However, the amplitudes of the SHP-generated oscillations are relatively small compared with the amplitude of the potential energy contributed by the planet�s ordinary matter. Consequently, the oscillations affect the process by which matter coalesces to form a satellite mainly in the vicinity of the classical Roche limit. Outside this range of radii, the UG-based model becomes consistent with the results of the classical Roche model. Hence, in agreement with the Newtonian theory, no satellites can formbelow the vicinity of , while beyond this range, planetary rings coalesce into satellites over time. However, contrary to the prediction of Newton�s theory, in the vicinity of , rings and small satellites may coexist. 12 As matter of fact, the UG theory leads to the conclusion that the rings are composed almost entirely of tight spirals. 13As will be shown, the effect of and on the morphology is relatively small, therefore reducing the minimum number of independent variables required to explain and emulate the rings of Saturn to five. 14 Equation 5-3b can be proven with the aid of the centrifugal force equation , leading to . Subsequently, substituting in the kinetic energy term on the left side of equation 5-3b proves this equation. Note that the orbiting object velocity is non relativistic, and that observations have established that the deviations of the motion of Saturn�s rings objects and satellites from Kepler�s laws are minimal, thus the contribution of the SHPs to the overall force must be very small. Therefore, the non-relativistic centrifugal force, which neglects the contribution of the SHPs to the overall amplitude of the force, should provide a good approximation. 15 In mathematical terms, ordinary matter affects the location of the minima through the term in the denominator of equation 2-1-42. As , the ordinary matter effect is significantly smaller than for any case where , and diminishes as increases. At low indices, the influence of ordinary matter is limited to shifting the minima locations, causing a relatively mild distortion to the overall ring structure. Inclusion of the ordinary matter contribution in the UG calculations requires the use of a wide range of energy scales in the two dimensional maps, which would overwhelm the SHP contribution, flattening the oscillations contributed by the SHP groups to the point where the local maxima and minima become almost indistinguishable. Therefore, the term was left out. 16 Grayscale was applied to indicate the energy level at any given display point, where darker shades represent higher potential energy levels. 17 Note that the multiplication by in equation 5-4 does not affect the morphology of the ring system, reducing the number of independent parameters needed to five. 18 This approximate value was obtained via trial and error, by simply calculating the map of the various rings to determine the range of values that correctly provided areas of abundant fine structure and areas of little or no fine structure. 19 Note that Cassini reported the existence of ultra-fine structure with kilometer scale in the inner A ring, which may require an additional third SHP group with a velocity . An extremely rapid SHP group may also explain the structure of Saturn�s dusty rings, such as the G and E rings. 20 Note that it is possible that the mass of the superheavy particles in the second group may differ slightly from . 21 A tilting effect was achieved by reducing the scale of the axis. 22 The resolution of the axis was reduced by a factor of ten relative to the axis in order to mimic the tilting of the ring plane relative to the viewing angle of the telescope in figure 5-5b. 23Figure 5-6b is displayed in lower resolution relative to figure 5-6a, in order to fit with the resolution of the observed ring. 24 For a more detailed analysis, see Chapter VI. 25A good analogy to this process is the Archimedes screw pump, which consists of a screw rotating inside a hollow pipe, historically used to transfer water from a low-lying body of water into irrigation ditches. As the screw rotates endlessly around its axis without any forward motion, it elevates a volume of water by pushing it forward along its axis of rotation. In the present case of the orbiting ring object, the SHP contribution to the force acting on the object is small relative to the Newtonian contribution of the planet�s ordinary matter. Therefore, the rotating spiral is powerful enough to replenish the minute amount of energy lost by the ring particles in less than seconds it takes the SHP groups to complete a full rotation around the center of Saturn, but not sufficiently powerful to advance the particles outwards. A more complete analogy will be provided in Chapter VI for the case of galaxies, where the rotating spirals demonstrate sufficient strength to pump out ordinary matter in the form of galactic wind. 26 The time it takes the SHP groups to complete a full rotation around Saturn center is approximately seconds. 27 A good analogy can be found in sound waves, where the amplitude and frequency of the sound, rather than the exact phase at a given moment, determine our perception of its loudness and pitch. 28The two dimensional images do not contain the term for the reasons discussed above. 29In order to demonstrate how the spirals are related to the potential energy waveforms, the three waveforms are overlayed with two dimensional calculated images of the potential energy of the given object. This requires displaying the waveforms and the images of the calculated potential energy using the same coordinates. Therefore, the equations of the waveforms were multiplied by respective factors of , and , and shifted down by , and units (units of ) respectively. The method used to calculate the approximate number of SHPs in each group ( and ) will be described later in the chapter. 30A clear demonstration, displayed in Figure 5-9b, was created using increased values of , and a reduced radius of , where the point was layered only when . These values do not fit the Saturian ring structure and are only intended to provide a more vivid display of spoke features. 31 It is often the case with optical patterns that to be observed they must adhere to certain optimal geometrical conditions. For example, holograms may require a relatively narrow range of viewing and illumination angles, as well as a narrow range of wavelengths for the illuminating light. The quality of holograms also depends on the density as well as other properties of the film�s emulsion. Slight variations in any of these parameters may make the difference between a sharp image and no image at all. 32 Similar dynamics have been observed in the D ring, where D72 was reported to have transformed from a bright, narrow ringlet of less than to a broad and diffuse structure which extends over during the 25 years that passed between NASA�s Voyager and Cassini missions. In addition, the F ring is reported to be dynamic, and has changed significantly since the Voyager mission. 34 As the influence of superheavy particles reduces drastically above the SHP oscillation range ( , the SHP effect on satellites farther than Lapetus is not significant. 35 Since the purpose of the present discussion is to estimate the number of superheavy particles, a quasi-relativistic, rather than a complete relativistic correction, was made by the inclusion of in the force equation. 36 The calculations in this section use the following values: , , , , .